Afam Nduaguba worked two jobs to support his family, toiling days in a pharmacy and nights as a security guard — and sometimes getting beaten up for his trouble. Harvard Medical School (HMS) was so far removed from his teenage expectations, it wasn’t even a dream. Nduaguba, who is graduating with an M.D. from HMS, was 16 when he arrived with his family from Nigeria on Christmas Day 2000. The family of seven leaned on the Nigerian community in the Boston area, splitting up to live with other families. Within weeks of arriving, Nduaguba went to work and then to school. His parents valued education — his father had a master’s degree from Massachusetts Institute of Technology — so Nduaguba and his older brother enrolled in Roxbury Community College for the spring term. Though Nduaguba had finished high school, he struggled. In a new country with few resources and needing to help support his family, he failed some courses. Academic probation followed, along with ineligibility for financial aid. That made it more important that he work, which caused schedule conflicts and missed classes. “I spent five years at Roxbury Community College. It should be a two-year program,” Nduaguba said. But he stuck with it. Nduaguba never doubted he was academically capable, but his family’s economic well-being came first. Finally, things began to turn around when he enrolled in a Saturday class in anatomy and physiology. Teaching the class was a Ph.D. from Harvard-affiliated Boston Children’s Hospital, who urged Nduaguba to consider medical school. 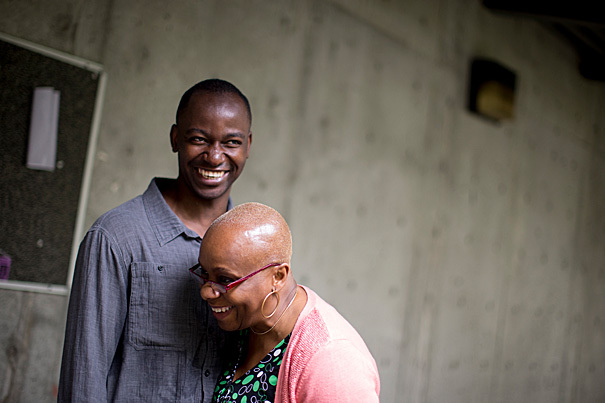 He pointed Nduaguba to the CURE program at Harvard-affiliated Dana-Farber Cancer Institute, a step that he said changed his life. Through CURE, Nduaguba began working in the lab of Nabeel Bardeesy, an associate professor of medicine at Massachusetts General Hospital, another Harvard affiliate. Bardeesy said Nduaguba had a curiosity and an “incredible energy about him.” Bardeesy believes the time in his lab helped convince Nduaguba that he could succeed at a place like Harvard. Nduaguba graduated from Roxbury Community College and enrolled at the University of Massachusetts, Boston. He completed a bachelor’s degree in biochemistry two years later, in 2009, while continuing to work with Bardeesy. His grades had improved, but his early failures were still on his transcript. Regardless, he applied to Harvard Medical School and he was accepted. He found Harvard dramatically different, in terms of resources and student support. He was able to explore medical options through experiences like the Family Van, which provides health care to underserved Boston neighborhoods. And he spent a summer in Rwanda, where the desperate need for surgeons shifted his early interest in cancer medicine to orthopedic surgery. In the fall, Nduaguba will start a residency in orthopedic surgery at Yale-New Haven Hospital. He hopes one day to provide surgery in resource-poor settings, though he acknowledges things can change.